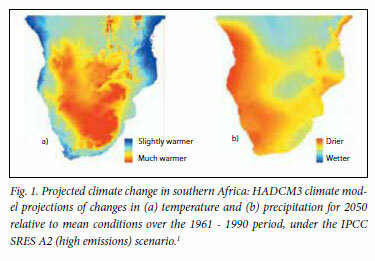 Projections show that the effects of climate change in Africa will not be uniform over the region. The region is extremely vulnerable to climate change because of poverty, a high pre-existing disease burden, fragmented health services and water and food insecurity. 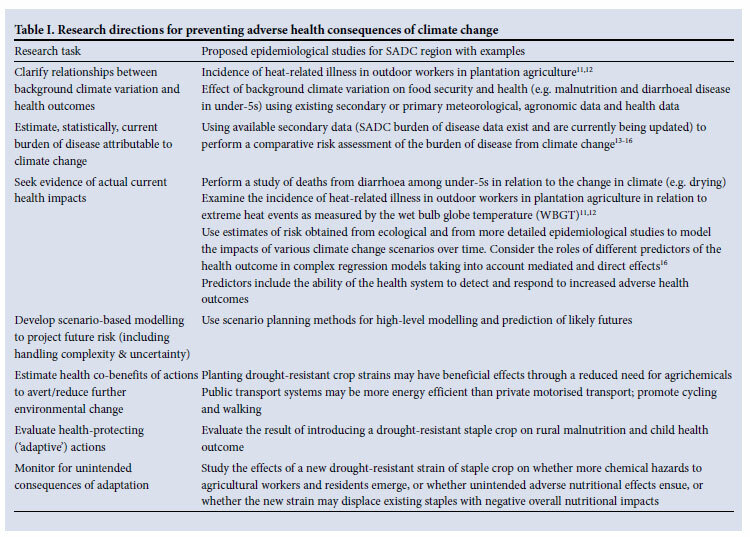 Despite the consensus that locally relevant information is necessary to inform policy and practice related to climate change, very few studies assessing the association between climate change and health in southern Africa have been conducted. More comprehensive information is therefore urgently needed for the southern African region to estimate the health risks from projected future changes in climate. Evidence is that the southern African region (Fig. 1)1 is experiencing an increasing frequency of hot days and a decreasing frequency of extremely cold days. Rainfall trends are variable, but evidence points to an increased interannual variability, with extremely wet periods and more intense droughts in different countries. Projections show that changes will not be uniform over the region; the central, southern land mass extending over Botswana, parts of north-western South Africa, Namibia and Zimbabwe is likely to experience the greatest warming of 0.2 - 0.5ºC per decade. Frequency of extremely dry winters and springs will increase by roughly 20%, while the frequency of extremely wet summers will double. Warming is also predicted to increase the frequency and intensity of tropical storms in the Indian Ocean. The region is vulnerable to climate change because of poverty, a high pre-existing disease burden, fragmented health services, and water and food insecurity. Despite the consensus that locally relevant information is necessary to inform policy and practice related to climate change, very few studies assessing the association between climate change and health in southern Africa have been conducted.2-4 Existing research focuses on infectious diseases - particularly malaria. Little work has been done on attributing disease burden to climate change in the region. Furthermore, an overview of health considerations in the National Adaptation Programmes of Action for climate change in least-developed countries and small-island states found that health was not seen as a priority, as most activities focused on biodiversity and agricultural activities.5 Very few institutions specialising in climate change and health were identified. The health effects of climate change are not uniform and will be influenced by local environmental conditions, socio-economic circumstances, the extent of adaptations implemented to minimise the full range of threats to health, and other modulating factors.6 The IPCC Working Group 2 report (2007)7 shows that the health consequences of climate change will fall primarily on low-income, poorly resourced and geographically vulnerable populations. Importantly, planning and action will need to be intersectoral, draw on local data, and involve local and regional authorities and health care providers. Corrective activities may be grouped into mitigation, adaptation, education and training, and raising awareness. Research is central to all these, as it will inform identification and assessment of effects, comparison of interventions, and determination of best practices. Regarding mitigation, 5 African countries are responsible for most of Africa's greenhouse gas (GHG) emissions, with South Africa by far the greatest emitter, responsible for 39% of the continental total - making GHG emissions in the SADC region relatively higher than in other regions of Africa.8 This issue is a high priority for intervention and will depend on national energy policy. Adaptation needs to be underpinned by surveillance for climaterelated health risks9 including early adverse weather alerts and disaster preparedness. Beginning with the infrastructural, urban planning and housing design needs to consider climate- and insect-proofing, enhanced infectious disease control includes vaccines, vector control, case detection and treatment. Community partnerships are required to identify and solve health problems, including neighbourhood watch schemes aimed at the elderly and children. Mitigation and adaptation interventions should be monitored and evaluated for effectiveness and efficiency. Climate change and health should be incorporated as part of undergraduate and postgraduate public health education curricula, and appropriate training packages developed. Special efforts should be made to recruit trainees from areas at greatest risk from the health effects of climate change. Awareness should be raised through informing, educating and empowering the public at large, along with policymakers and all relevant stakeholders about the health risks of climate change as well as primary and secondary prevention strategies which can reduce the impact. To gain a more complex understanding from epidemiological modelling, it is important to incorporate confounding or interacting, non-climate variables. Scenario planning should incorporate information about trends in other determinants of health outcomes for which future extrapolations are considered feasible (e.g. demographic trends in age structures); likely future contextual conditions (e.g. uptake of domestic air-conditioning by 2050); the advent of relevant vaccines and likely consequent population immunity levels; and deliberate 'adaptive' changes (e.g. mosquito control programmes, heat-wave warning systems, flood protection measures). The health sector itself requires research attention as a result of the environmental effect of resource use and waste generation, and the need for sustainable health sector practices. Health economic analysis of climate-related health impacts, along with research into communication strategies for climate-related health issues, is an important research focus. Pressing action and research priorities include the assessment of the climate-related burden of disease in southern Africa, and the identification of appropriate adaptations for which there is existing evidence of effectiveness and cost-efficiency elsewhere, particularly parts of the globe with similar climate-change scenarios.